Is one of your new year's resolutions to become good with money? 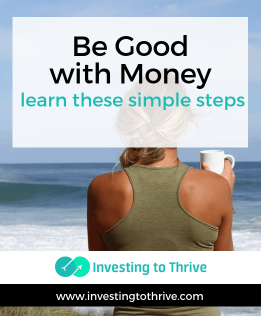 Have you had a lingering desire to be good with money? Here are simple steps to get there. Step 1. Tell yourself that you can be good with money. You've made some good decisions and some not-so-good ones with money, like everyone has, even people who are amazing with money. Recognize you may be better at money than you give yourself credit. Do you know when your bills are due? Do you contribute to a 401(k)? Do you determine whether a monthly car payment fits within your budget? Do you know the cost of gym memberships, restaurant meals, and cups of coffee in your area? If yes, way to go — you're good with money and can become even better. Let your doubting self know that everyone makes mistakes. Your job in learning to be really good with money is to learn from your mistakes. Set up systems to avoid them in the future. For example, did you forget to pay a credit card bill? If yes, set up alerts to remind you or set up an automatic payment. Step 2. Spend less than you earn. I know this seems way too simple and cliche. But spending less than you earn is the foundation for everything: from getting out of debt to becoming wealthy. What's tricky about this step though is that it's easy to fool yourself into thinking you're spending less than you earn. For example, you may spend less than you earn in March, April, May, September, and October. But when property tax bills come, annual insurance bills hit your inbox, and vacation expenses pile up, you may realize that sometimes you spend more than you earn. These sporadic bills throw off your budgeting. One solution to managing your budget on a month-to-month basis is to set up payments on a monthly basis for as many bills as possible. You could likely set up your homeowners or renters insurance in this way as well as your car insurance and utility bills. This arrangement may trigger a service fee but if that charge is less than an overdraft fee, then moving to monthly payments could be a smart move. Another technique is to set up a cash fund to handle these costs and other unexpected expenses. Start by dividing your annual charges and big expenses by 12, and then deposit this money in a savings account on a monthly basis. If you can't afford to make this move, then cut your expenses until you can. You might cut out the gym membership in the summer when you can exercise outside or cook a few nights more each night … whatever it takes to reduce spending to the right level. Step 3. Deal with the money issue that bugs you. This step is difficult because you want to avoid the issues that trouble you. When they're just lurking around, they seem bigger, weightier, more mysterious, and more challenging to handle than they truly are. But when you confront the problem, you usually find it's not as insurmountable as you imagined. For example, if a small service charge from your bank is bothersome, figure out how to avoid this fee. You may need to carry a larger account balance or you might need to switch to a credit union. If you have a subscription for a service that you use infrequently, cut it off so you'll eliminate your losses rather than trying to figure out how to make the most of the service now. If you're not sure whether the beneficiaries on your retirement accounts are correct, visit your account online to check them and make updates. You don't have to tackle everything at once. But if there's something that bugs you, take care of it so this issue won't weigh you down. Then you can tackle more money issues. Step 4. Devise a plan to pay off debt. I believe you can be good at money or becoming good at money and still carry debt, especially if you're young and getting started. If you live in a town with limited public transportation, then you may need to take out a car loan in order to get reliable transportation to work for example. Still, developing a plan to pay off debt means you're good with money. This process could be as simple as applying extra amounts to eliminating a credit card balance. Alternatively, you may want to design a spreadsheet to model how you plan to pay off debt over several years. Knowing where your money goes and how it's being employed to improve your net worth means you're getting good with money. The holy grail of being good with money is that you're investing in your future. To be good with money over a sustained period of time, you'll need to be able to generate an income without working and that involves investing of some type. The first place many people look to invest is their employer's retirement plan if available. Many people who are good at money save only within one of these accounts and do well for themselves. But at some point, it can be useful and desirable to invest in something that's not tied to your job. In this way, you'll enjoy greater flexibility in generating and accessing cash for various expenses, such as college for your kids or a round-the-world tour. Depending on your stage of life, certain numbers may be more telling than other measures. If you're retired from a full-time job, then you may not be setting aside any money for retirement and you'd score low in this measure. Still, looking at objective information, rather than a general feeling, is a great way to view your standing and progress. What milestone made you believe you're good (or not good) with money? What are you going to do this year to improve your thinking and results?